This weekend I decided to attempt a death defying stunt! I decided to bake from scratch without a recipe and pray that we would survive the aftermath. Although my baking skills have improved I am nowhere near the realm of being what you could call a baker. I had two bananas sitting on my counter that were pretty speckled and starting to look sad. I could have just made some banana bread and be done with it, but I thought I would challenge myself and try something different. One of my favorite combinations is peanut butter and bananas, (remember my Banana Chocolate Chip Espresso Cupcakes with Peanut Butter Frosting?) and I thought I would put my creative cap on and whip something up with that combo. My intent was for the base of these bars to be crispy/crunchy but they turned out more bready/crumbly, but still yummy. In a mixture cream together butter and brown sugar until light and fluffy. 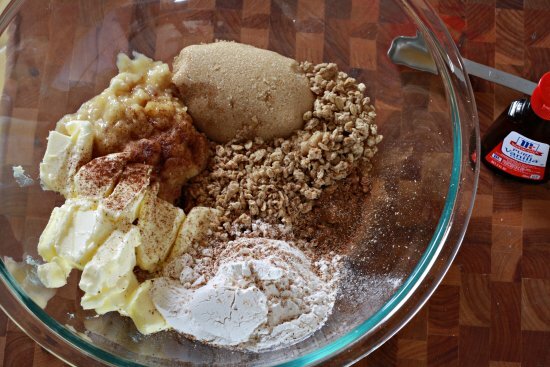 (I skip this, oops) Using a for mix in remaining ingredients until just combined. It will be lumpy and thick. 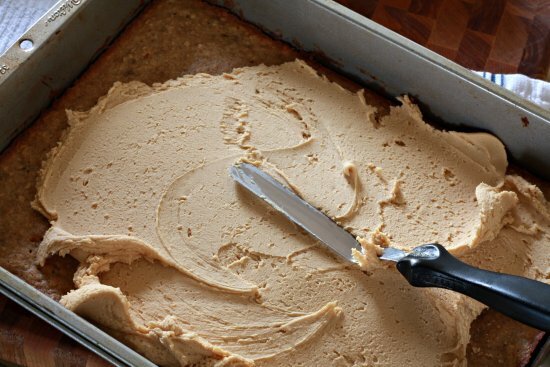 Spread the mixture evenly in a buttered 9 x 13 pan. Bake for 10 -12 minutes at 375 degrees, or until edges are browned and toothpick test comes out clean. Remove from oven and let cool completely. 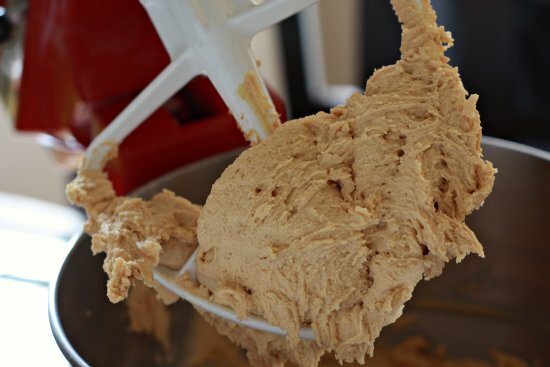 While bar base cools beat together peanut butter filling until smooth. 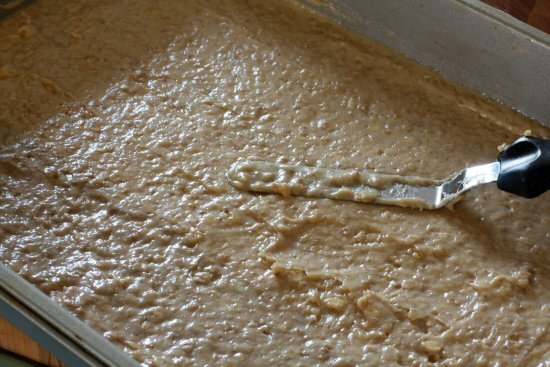 Stick your finger in it and taste, then remove all filling from the beater and lick beater clean. It is very important you do this! Once bar base has cooled completely spread peanut butter filling over base evenly. Sprinkle with granola over top and gently push the granola into the peanut butter filling. Refrigerate the bars for 30 minutes, cut and serve! Here is your….well my bar, you will have to make your own. I was pleasantly surprised with my creation, although it didn’t turn out exactly how I initially wanted it too. The peanut butter topping is perfectly peanutty and sweet and you can taste the banana in the bar without being over powering. There is also a lot of texture in the bar because of the granola. They are tasty, tasty and I would make them again. It as almost like banana bread spread with peanut butter. Try them out and please feel free to tweak. Although they are yummy I think they need some perfecting. My first attempt to bake without a recipe I would consider not perfect but successful and we all survived. Banana granola peanut butter bar for me! In a mixture cream together butter and brown sugar, (I didn’t do this, oops) using a fork combine the remaining ingredients with the creamed butter. 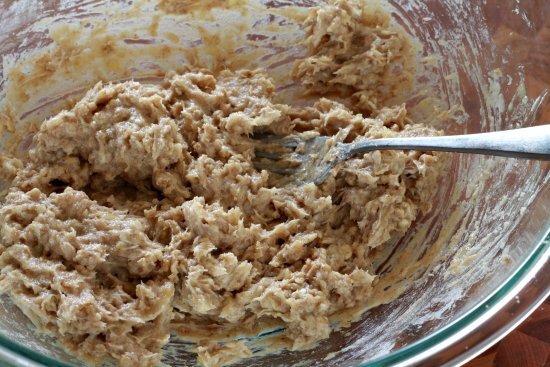 Spread mixture evenly in 9 x 13 buttered pan, bake in the oven at 375 degrees for 10 – 12 minutes or until edges are browned and toothpick test comes out clean. Let bars completely cool in pan. In an electric mixture beat together filling ingredients until smooth. 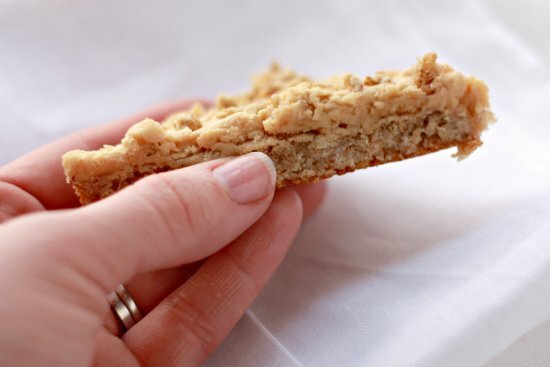 Spread evenly over cooled bar base, sprinkle with granola, gently press the granola into the peanut butter filling and refrigerate for 30 minutes to set. My husband always says, when you start out with good ingredients . . . How could it be bad! Looks like you have done a wonderful thing! Trust me they were delicious!!!! Yum! congrats on trying again with the baking — they look delicious, who doesn’t like the PB + banana combo? 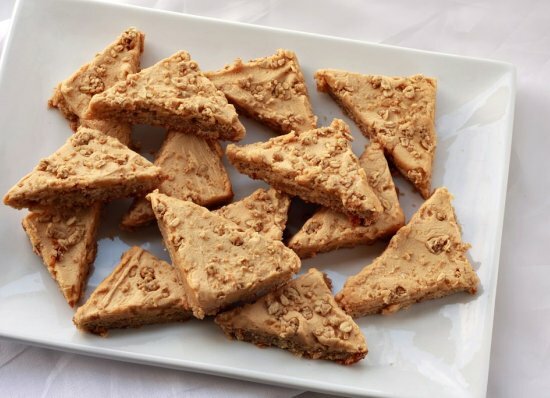 🙂 and I like that you cut them into triangles, they look like little peanut butter sandwiches.